Our Dynasty Capsule off-season series kicks off with a look at the hot NFC up-and-comers. The New England Patriots made one of the more notable trades of the 2017 season, sending quarterback Jimmy Garoppolo to the San Francisco 49ers in exchange for a 2018 second-round pick. Garoppolo has been impressive so far the 49ers, leading them to five straight victories to close out the year. He averaged 308.4 yards passing with six touchdowns and five interceptions during that stretch. 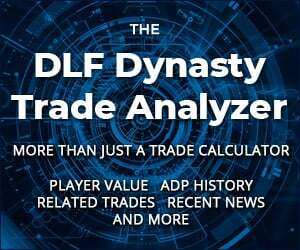 His December DLF ADP is 147.0, near where Patrick Mahomes and Mitchell Trubisky are being selected. I like the futures of all three of these young quarterbacks. However, would prefer Garoppolo right now based on what he has shown this season and the fact he is tied with Kyle Shanahan (assuming he re-signs with the 49ers). Some quarterbacks being taken a few rounds earlier than Garoppolo include Derek Carr, Matt Ryan, and Matthew Stafford. I could envision Garoppolo passing these players over the next couple of seasons if the 49ers are able to add some more talented receivers around him. The hype surrounding him is undoubtedly very high right now, but he could be a nice buy-high target whose value could continue to rise. Kyle was introduced to fantasy football at a young age, tagging along with his dad and brother for work league drafts. From calling out draft picks to placing the stickers on the big board, he was immediately hooked. His favorite format is devy leagues because there is always so much to study and learn. I think Kittle over Ebron is crazy talk. I can see the argument for him over who ever is the TEN TE, but not Ebron. Eh, I don’t know. They’ve shown about the same consistency and Kittle has had three less years in the league. I wouldn’t want to count on either of these guys as my starter rolling into next year and with that being the case I’d be inclined to take Kittle in that it isn’t abundantly clear what his ceiling is yet (then again, as little as he’s shown except for the second half of this year, maybe Ebron’s ceiling is unclear too). Ebron’s dynasty value got a real shot in the arm late last season. I’m an offseason seller wherever I own him, which isn’t very many spots. Great time to flip him for something nicer in return, just don’t trust him to ever turn the corner and be that consistent TE1 we envisioned coming out. But I’m with you on Ebron’s value relative to Kittle’s, it would take Kittle and another piece for me to make that deal right now. Truth is SF will prob look to add legit talent at TE and WR sooner than later, it’s what Jimmy needs to turn those 300 yarders with zero TD’s into 300 and 3’s.